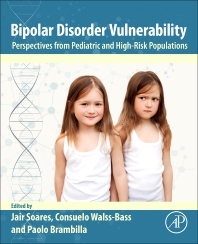 Bipolar Disorder Vulnerability: Perspectives from Pediatric and High-Risk Populations synthesizes our current understanding of high-risk and pediatric populations to aid readers in identifying markers of vulnerability for the development of bipolar disorder, with an ultimate goal of the development of drug targets and other therapies for early diagnosis and treatment. The book provides readers with an understanding of biological and environmental factors influencing disease manifestation that will aid them in defining discrete clinical stages and, importantly, establish an empirical basis for the application of novel therapeutics in a phase of illness during which specific treatments could more effectively alter disease course. Whereas most of the literature available on the pathophysiological mechanisms of bipolar disorder focuses on chronically ill adult individuals, this represents the only book that specifically examines pediatric and high-risk populations. An estimated 30 to 60 percent of adult bipolar disorder patients have their disease onset during childhood, with early-onset cases representing a particularly severe and genetically loaded form of the illness. Dr. Soares is Professor and Pat R. Rutherford, Jr. Chair in Psychiatry at the University of Texas Health Medical School at Houston, Executive Director of UTHealth Harris County Psychiatric Center, and directs the UT Center of Excellence on Mood Disorders. Dr. Walss-Bass is Associate Professor and Director of the University of Texas Health Brain Collection for Research in Psychiatric Disorders in the Department of Psychiatry and Behavioral Sciences in Houston. Dr. Brambilla is Associate Professor of Psychiatry at the University of Milan and Chair of the European Psychiatric Association (EPA) Neuroimaging Section.